Recommendations: I would brecommend Eunoia by Christian Bok. For each chapter in this book, Bok uses only one vowel, yet still manages to tell a remarkable story. I love the idea of using limiting factors to create art. I would also recommend Straight Outta Compton by NWA. There is a rawness in the tracks, both in the composition and the recording, that is absolutely honest art at its finest. 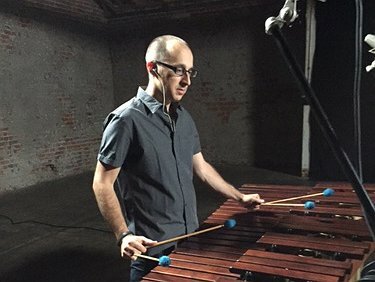 Website/Contact: If you enjoyed this 15 Questions interview with Cory Hills, he has a profile at Innovative Percussion and the LAPQ website. I started playing piano when I was in the second grade because my dad played this hilarious medley on the piano from when he was a kid. This included dance hits, classical hits, and most importantly part of Hungarian Rhapsody by Liszt! I wanted to do what he did, so I started taking piano lessons. I added percussion when I was in middle school and immediately fell in love with sound. I became obsessed with how instruments made certain sounds and why some sounded one way and others another way. This led me to pursue music at the university level, as well as to this day. This is an excellent question and one that could be a topic for a dissertation. For me, I did not find my voice until I was forced to find it. While doing my undergraduate degree at Northwestern University, I studied general percussion and had an amazing professor who made sure that we had fluency on each instrument and in most styles. I then pursued a more specific focus for my master’s degree in Australia, working on avant-garde percussion pieces that employed other elements of the arts, such as theatre, voice, art, dance, and more. It wasn’t until I left the world of academia and university life that I finally found my voice, which coincidentally had been there the whole time! When we’re in the academic system, so much is provided for us that we don’t have to use our voice. However, once we are thrown into the deep end, we quickly find it and realize we had it the whole time. The biggest challenge was being taken seriously and treated as a professional. I arrived back in the States following my master’s degree and additional fellowship thinking that I was hot stuff and should be able to get certain gigs. What I learned quickly thanks to wonderful colleagues and friends was that I had to earn the respect of my peers and those that were older (and doing the hiring!). I learned at an early age that professionalism matters just as much as artistry. What’s cool is that they both develop concurrently. I worked hard to “rise the ranks” so to speak as a professional, while I worked hard to develop as an artist. I may be fringe on this, but I have no care for factors like mood, ergonomics, and technology among others. I need a physical space with a lamp and TIME TO WORK! Seriously, I believe that one of the biggest roadblocks to artists in the 21st century is time. We are stretched so thin these days because we are constantly pulled in 80 directions: teaching, playing, composing, recording, writing, studying. Most of this is to pay the bills to live in cities with arts districts that were once more affordable. While this is definitely a truth that artists need to face these days, it is unfortunate that the need to make money has surpassed the need to create art. That is why I believe time is singularly the greatest criteria in developing as an artist. I absolutely love percussion. The funny thing is that I wanted to play viola, but the orchestra teacher told me my arms weren’t long enough (I’m doubting the truth in this!). I still wanted to play an instrument so I signed up for percussion because the band director needed another warm body in the back of the band. The rest is history! As I mentioned above, I fell in love with sound and the endless possibilities for sound found within the world of percussion. As for the important qualities in percussion and how that influences the musical results, I would refer to the mantra I’ve been following for a couple decades: sound matters. How can I create the best possible sound for a given situation? What do I need to do technically and musically to create this sound? This mantra guides my thinking so that I am constantly thinking (and thinking critically) about the sounds I am making. This has carried over to the Los Angeles Percussion Quartet (or LAPQ). One reason I love playing in the group is that each member adheres to this mantra. And in our album, Beyond, you’ll hear us going above and beyond (pun intended!) to create the best possible sound. I wish I had a fixed schedule! My wife has a full-time job and we have two small children, so I am a stay-at-home dad and professional classical musician. There are days when this is easier and everything works perfectly – I get practice time, the kids are happy, and the house is relatively clean. But to be honest, life happens, and I am constantly juggling ear infections and school projects with performances, touring, and recording. I initially tried to separate these two areas, but ended up failing miserably. Instead, I have fused them since my family and my job are vital parts of my identity and my responsibility. I’ll use the latest LAPQ release Beyond as the basis to answer this question. This album marks a move for our group beyond the west coast tradition we have championed for years. As a result, we collaborated with composers from the west coast and composers from Iceland. Each piece is a commission and we were fortunate to have each composer at the recording session. The end result is magical. We had a great deal of time at the recording studios (Sono Luminus Records) with the composers and producers, so we were able to dig beneath the surface of each piece and each sound. I have been in recording sessions where time really is money and you are rushed to complete the project, thus resulting in a good recording but not a great one. In the case with Beyond, we were able to create a great recording, putting our personal stamp and interpretation on each piece, while also adhering to the wishes of each composer. I learned at an early age that professionalism matters just as much as artistry.